Our mission and vision statements have been integral to our faith community for over ten years. 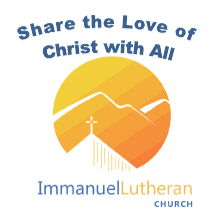 Each worship service concludes with our mission statement: “Share the Love of Christ with All!” Additionally, Immanuel’s vision statement “Immanuel is called to be caring, compassionate and diverse congregation spiritually nourished through Jesus Christ and reaches out to the community at large” is recited prior to each church council meeting. In 2002, the congregation voted to pursue a visioning process to develop a strategic plan. Our strategic plan helps to identify our hopes and dreams for the future, set our priorities, and sets an action plan in place to help to attain those hopes and dreams. Immanuel has a strategic planning team, comprised of a wide range of members of our congregation, which meets annually to review progress on our goals and set direction for our congregation for the upcoming year.